The Red Sox and Fenway Park will always have their staples. In the 80s, you could count on Jim Ed in left, Dewey in right, Ken Coleman in the booth, and a pole in the way. A less-celebrated fixture of Fenway in that neon decade was two-time All-Star catcher Richard Leo "Rich" Gedman, Jr.
Platoon-mates and backups came and went, but only Geddy was behind the plate from the Carter administration to the fall of the Berlin Wall. Here was a hometown hero, a stand-up guy who never quit, even when his body begged him to. He was the backbone of the defense, the glue that held the pitching staff together, and when he connected on that helicopter swing, Pesky's Pole braced itself for another frozen rope. Rich grew up in the City of the Seven Hills--Worcester, not Rome--45 miles west of Boston. 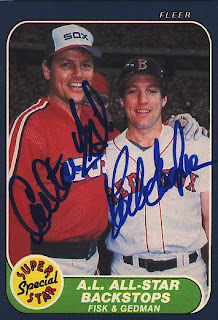 The Red Sox signed him as an undrafted free agent out of high school in August 1977. He quickly shot up through the system. On September 7th, 1980, a bespectacled Gedman, wearing number 50 on his back, pinch-hit for Carl Yastrzemski in his Major League debut. A few weeks later, on his 21st birthday, he caught Dennis Eckersley's one-hitter. After that season, Carlton Fisk was gone, and Geddy, the hometown boy built like a tight end, was set to become the next first-string catcher at Fenway. In early '81, shortly after catching the first nine innings for Pawtucket in what is still pro baseball's longest game, he came up to the big leagues for good, now wearing his familiar number 10. That year he would be named Sporting News' AL Rookie Player of the Year, and would finish second in the AL Rookie of the Year voting. After two more years of splitting time behind the plate, Rich became the bona fide starter, and showed his power as well, hitting 24 dingers and slugging over .500 in 1984. In 1985, he set personal records in BA, 2B, RBI, and OBP, and performed the rarest of feats, hitting for the cycle--only the sixth catcher of the century to do so. That year he was named to the All-Star team. But it was 1986 that would define not only many of our childhoods, but Rich Gedman's career as well. In April, Rich was again part of history when he caught Roger Clemens' 20 strikeout game. He was hitting .300 at the end of that month, and was again named to the All-Star team in July. For the third consecutive year, though, Rich caught over 130 games, and the wear-and-tear would finally start to affect his game. He slumped severely in July and August, before hitting .284 in the final month just to get his season average to .258. But the Red Sox were going to the playoffs, and Rich was primed for his first trip to the postseason. In the '86 ALCS, the Red Sox went down three games to one. Game five would be the precise moment when Gedman reached the pinnacle of his career. His two-run homer in the second off of Angels' ace Mike Witt put Boston up 2-0. After getting two more hits off of Witt, and throwing out two runners on the basepaths, Rich came up to bat in the ninth, his team down a run, with nobody on and two men out. Angels manager Gene Mauch hadn't forgotten Rich's three hits. Seeing him up there as the tying run, and an out away from the World Series, Mauch removed Witt. Gedman, knowing the season depended on him, had to sweat it out as Gary Lucas warmed up, and over 60,000 California fans prepared to storm the field in celebration. Lucas threw--and plunked Rich Gedman. Now Rich was the go-ahead run at first. Dave Henderson came up and hit that unforgettable home run, putting life back in the Red Sox' season. It was Gedman's three hits that made it possible. The game went to extra innings, and Rich's bunt single--his fourth hit, and his fifth time on base that day--put what would be the winning run on third, setting up Hendu again, this time for the game-winning sacrifice fly. After that, the series went back to Beantown, where the Sox would win the final two games easily, advancing to the Fall Classic. Geddy's final average in the ALCS was .357. Luck stayed on Gedman's side in the early stages of that fateful World Series, In Game One, his grounder went through the legs of Tim Teufel--he of "the shuffle"--scoring the game's only run. He also called Bruce Hurst's masterful performance that night. Rich's late-inning single helped a rally that put Game Two away, and the Sox were sitting pretty. But they sloppily lost the next two at home, before salvaging Game Five. As Game Five of the ALCS was the top of the mountain for Gedman, Game Six of the World Series was the moment he started bouncing down the other side. After a poor performance in the field and at the plate (he hit just .200 in the series), Rich still had a chance to celebrate a championship. But with the Mets one strike away from elimination, and down two runs, they started getting hits. When the tying run was at third, Bob Stanley threw a pitch that curved away from Gedman, bouncing in the dirt and getting through to allow the run to score. Before the delirium subsided, Mookie Wilson's grounder was squirting through Bill Buckner's legs, and the Mets had won. Despite Geddy's homer in Game Seven, the Mets would come from behind again, winning it all. Gedman would never return to the World Series. Was Stanley's pitch catchable? No. Was it blockable? Probably. It was scored a wild pitch. But many remember it as a passed ball. Some even base Rich Gedman's entire career on that play. Between eras of blaming Bill Buckner for '86, Sox fans came up with a laundry list of players and events to place blame on. Gedman was part of that blame parade. They are moments that will live forever. And they all have one thing in common. Gedman reaching for that ball as Mookie leaps out of the way; Gedman behind the plate as Mookie hits the grounder; Gedman in the background as Buckner misses the ball; Gedman standing in disbelief as Knight crosses the plate right in front of him. It was only a matter of time before people decided, "Hey, this Gedman must've done something wrong..." Do a little research, though, and see that if it weren't for Gedman, there wouldn't have even been a World Series for the Sox that year. "I wish I could have played better than I did [after '86]. For whatever reason, I didn't. I can't tell you why. I know when it ended, I loved the game just as much as when I started. For some reason, I just didn't play as well. It was probably more mental than anything else. I started to doubt myself." Looking at the stats, he hit about .330 at Fenway in '84 and '85 combined, then fell to .214 in '86. His OPS went from the .900s to the .500s over the same stretch. Maybe he just forgot how to use Fenway to his advantage. He also says he doesn't like to use injuries as an excuse, but he suffered from scores of them. Look how many full games he caught in '85 and '86. No catcher in the league did it more than Gedman either year. (He caught more full games in those two seasons than he did for the next and final seven years of his career.) He also caught all 14 games--start to finish--of the '86 postseason. All this work had to have taken its toll. Then there was the debacle of the '86 All-Star game. Forced to catch knuckleballer Charlie Hough, Gedman had a rough time, with a run scoring on a passed ball and a wild pitch over a two-batter stretch. Maybe that was the moment Rich's fall from grace began. The current Red Sox ownership has kept Gedman in the family. In 2004, he and other former Sox greats finally got their rings. Gedman is now truly a hometown hero, managing the minor-league Worcester Tornadoes. His son Michael currently plays baseball at LeMoyne College. 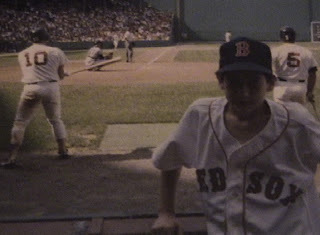 Jere is a fourth-generation Sox fan, and since March 2004, writes the blog A Red Sox Fan In Pinstripe Territory. I still remember a grand slam Gedman drove in as a pinch hitter in Detroit in 1986. Gedman also won a league championship in 2005 as the manager of the independent (not minor) Worcester Tornadoes of the Canadian-American Association of Professional Baseball, which is no small feat, as he's working primarily with NDFAs and affiliated-ball burnouts. Wooden: I know about the championship, sweeping through the playoffs in '05. I also know about his being the third base coach of the North Shore Spirit in '03, as I drove from Danbury, CT to Pittsfield, MA because it was the closest team in that league to me at the time, so I could get his autograph. I was trying to keep it to, for the most part, Rich's time with the Red Sox. I had to stop at some point, heh heh. I sincerely apologize for calling the Tornadoes a "minor league" team, although it could be argued that that's what they are. Not affiliated with Minor League Baseball (capitalized), but each independent league could be called a "minor" (lower case) league. Classic Rich Gedman,1986 opening day in Detroit,froze at the plate and did'nt tag out D.Coles on a great throw from D.Evans. But later would hit a home run into the lower deck in right center & would screem at Sammy Stewart(before the ball left the yard) offf the bat of K.Gibson. He was one of a kind thier won't be another one like the Goon in Boston. I also have Rich Gedman in my baseball cards collection and I remembered I traded the card for a sandwich and a coke that my friend Bobby asked me, it was a pretty good deal! I must return in order to check your posts..
for the good data you might have here on this post. winter are readily toddlers and toddlers as well. Give up that company while being said to be wearing a be appropriate for and tie. Stay away from a lot of chains, glitzy gallstones and other inspiring accessories. Check out the list of five stores that will give you a great deals and offers on Black Friday 2019. These deals and offers is come once in a year.